This work package was closed on 2015. 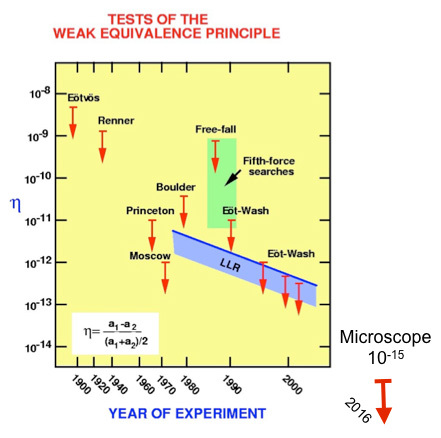 The Weak Equivalence Principle (WEP) states the equality between the inertial mass and the gravitational mass (universality of free fall), and is a cornerstone of General Relativity (GR). It can be tested with the Eötvös parameter — which is zero if the WEP exactly holds — proportional to the difference of the accelerations felt by two bodies made of different materials in the same gravity field. Physics beyond GR (e.g. string-theory-inspired gravity theories) may explain the accelerated expansion of the Universe and solve the dark energy problem. In this case, we predict a WEP violation between 10-18 and 10-13, while the current experimental limits are 10-13. The existing experiments (on Earth) are reaching their limits, so it is important to test the WEP in space. MICROSCOPE, a French Space Agency mission expected to launch in 2016, will improve the current limits by 2 orders of magnitude. 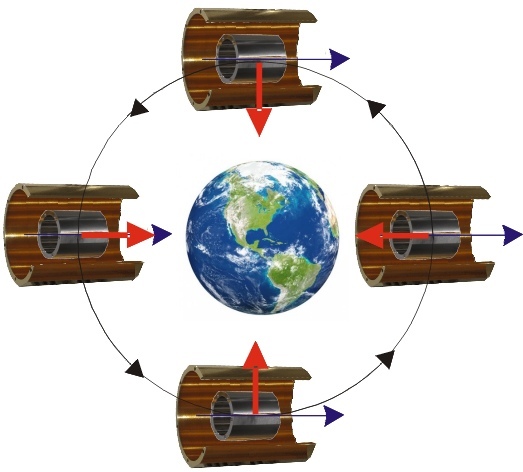 MICROSCOPE (French for ‘‘Drag-free micro-satellite for the Observation of the Equivalence Principle’’) is made of two ultrasensitive cylindrical electrostatic differential accelerometers. The first one consists of two coaxial test masses made of the same material (Pt) and is used to check for systematics; the second one consists of two coaxial test masses made of different material (Pt and Ti) and will effectively test the WEP. A violation of the Equivalence Principle is measured as the difference in acceleration experienced by the proof masses as they orbit the Earth. Measurement principle: the WEP is tested along a given axis. A WEP violation results in a signal at a well known frequency depending on the satellite’s orbit and attitude. Gaps in time series occur through several causes, such as telemetry loss, micrometeorite impacts, saturation due to mechanical crackles. Missing data affect the measured power spectrum by a leakage of the high frequency noise into lower frequencies, where a WEP violation signal is looked. Missing data affect the measured power spectrum by a leakage of the high frequency noise into lower frequencies, where a WEP violation signal is looked for (see Figure, blue vs green curves). 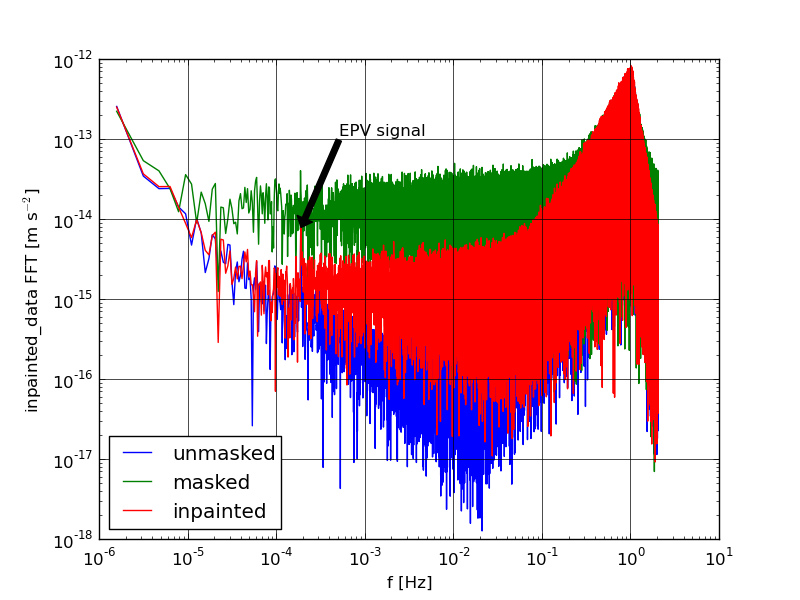 We use an inpainting technique to fill in missing data, effectively decreasing the measured power spectrum (red curve) and revealing the looked for signal (black arrow).